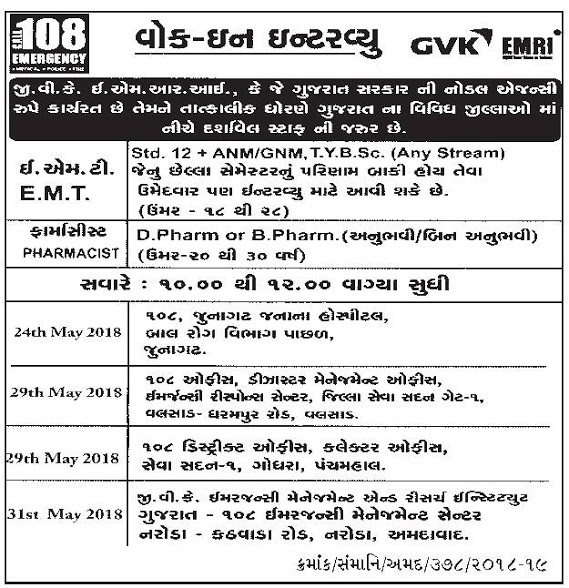 GVK Emergency Management & Research Institute has published Advertisement for below mentioned Posts 2018. Other details like age limit, educational qualification, selection process, application fee and how to apply are given below. Valsad: 108 Office, Disaster Management Office, Emergency Response Center, Jilla Seva Sadan Gate No. - 1, Valsad - Dharampur Road, Valsad. Godhara (Panchmahal): 108 District Office, Collector Office, Seva Sadan - 1, Godhara, Panchmahal. Ahmedabad: GVK Emergency Management Research Institute Gujarat - 108 Emergency Management Center, Naroda - Kathvada Raod, Naroda, Ahmedabad.